We hear a lot about all types of facilities transferring from the use of traditional cleaning products to those that are “green”-certified. And along with selecting these environmentally preferable products, cleaning professionals are often taught new and more efficient cleaning strategies. 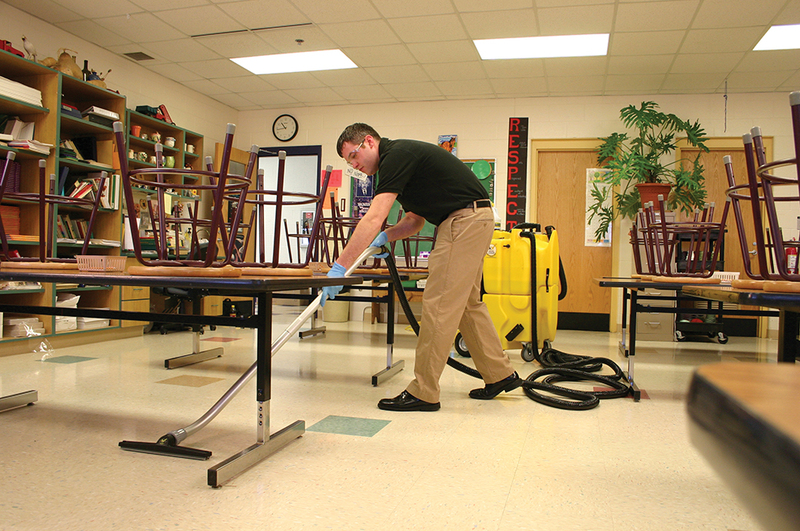 Now that they have adopted green cleaning, some administrators want to take the next step and integrate sustainability initiatives into their cleaning operations. Very often, administrators believe green cleaning and sustainability are essentially the same. While they indeed complement each other—and green cleaning solutions are invariably manufactured using renewable resources—they are not the same. Green cleaning refers to cleaning solutions, tools, and equipment that have a reduced impact on the environment. A high-filtration vacuum cleaner that significantly reduces the amount of dust and contaminants released into the air would be—and likely is certified as—an environmentally preferable cleaning product. Giving back to the community, for example, helping those who are victims of a storm or fire, or supporting an event that benefits the community. As far as ensuring that cleaning professionals are paid fairly and receive necessary benefits, this must be left in the hands of park and rec administrators. The same is true of giving back to the community. Park and rec centers, just by their very nature, are “givers.” However, administrators should always be on the lookout for opportunities to help the community. So that leaves cleaning and making cleaning more sustainable, which is what will be discussed below. If you have a minute, put down this article and walk to a janitorial closet. Look to see how many cleaning solutions are in the closet, and look for what is called an auto-dilution system. If there are many cleaning products in the closet, this will be addressed later. Auto-dilution devices appropriately dilute water and cleaning solutions. Most cleaning solutions—especially green ones—are highly concentrated. Using too much is wasteful and can leave a chemical residue on surfaces. Using too little will reduce the cleaning effectiveness of the solution. This system eliminates waste—promoting sustainability—and ensures that cleaning is effective. Evaluation of cleaning solutions. If there are many cleaning solutions—especially those used for the same or a similar cleaning task—eliminate those that are not needed. Purchasing a variety of cleaning solutions means that all these products need to be packaged using paper products; delivered using fuel and releasing greenhouse gasses; and producing waste once they are used up. One way to reduce the number of cleaning solutions used for the same purpose is to compare their effectiveness and their costs. Don’t be surprised if the most costly product falls short when it comes to effectiveness. Bulk purchasing. Let’s say the number of cleaning solutions used in the center is reduced from 10 to five. Those products should be purchased in bulk containers. One-gallon and ready-to-use containers should be avoided. By purchasing products in five-gallon containers, steps can be taken to reduce packaging, fuel, greenhouse gases, and waste. Waste reduction. Reducing waste is a big concern today. Landfills are filling up, and so much waste takes years to disintegrate. A perfect example is plastic trash-can liners. Did you know that recycled trash-can liners are not required under the latest version of LEED? This means that most of these liners do end up in landfills where they can take years to disintegrate. Here is an easy way to reduce this waste. Designate trash cans into “wet” trash and “dry” trash. Make it clear to staff members and visitors which type of waste goes where. If only dry waste ends up in the dry cans, those cans do not need liners. Custodial workers can clean the interior of those cans as needed. Only wet cans—for instance, for food waste—need liners. This will reduce waste—and costs—significantly. There is one more way to make the connection between green cleaning and sustainability, and that is to use no cleaning solutions at all. Today, the use of what is termed “engineered water” is growing in interest and popularity in the professional cleaning industry. These systems are made by a variety of manufacturers and, in most cases, are proving to be very effective. Tests on some, for instance, have shown they can sanitize surfaces. Sanitize does not mean that germs and bacteria on a surface are killed; it means that they have been reduced to a safe level, protecting human health. These systems all involve the use of water. For instance, electrolyzed water is tap water that has been electronically converted to form oxidizing cleaning agents. This makes it useful for cleaning surfaces such as floors. Aqueous ozone is another example. This type of cleaning system produces ozone electronically and mixes it with water, making it aqueous. Aqueous ozone has a near neutral pH, but can still be used for efficient cleaning and sanitizing. Another system is high-heat vapor. This system is not manufactured for consumer use. Water is heated to more than 250 degrees (F), which is hot enough to kill many forms of germs and bacteria and also leave surfaces clean. Finally, mentioned earlier was the importance of training as to green cleaning. It is just as important—if not more—when it comes to sustainability. Unfortunately, some professional cleaning workers have old habits of overusing some cleaning products, using specific cleaning solutions such as disinfectants where they are not necessary, or producing unnecessary waste. Training on how to clean sustainably can help eliminate these habits. And it should be an ongoing process. Sustainability, just like green cleaning, is a journey, and there is always more to learn. Ron Segura is founder and president of Segura & Associates, an international janitorial-consulting company based in the U.S. He has over 45 years of experience in all segments of the cleaning industry with 10 of those years spent overseeing the cleaning of over 4.5-million-square-feet for The Walt Disney Company. Reach him at http://www.seguraassociates.com.